Charlie - YGRR #01 - Yankee Golden Retriever Rescue, Inc.
Eighteen years ago, on April 23, 1985, we admitted our very first rescue Golden. He was a thin male stray estimated to be eight or nine years old. His future looked very dim because his time was up at the pound and since no one wanted to adopt such an old dog, his euthanasia was scheduled for the very next day. Within a week the dog, who came to be called Charlie, had a new lease on life. He was released to YGRR by the pound, received comprehensive veterinary care and was placed into a new home. Since Charlie, YGRR has provided rescue and adoption services to almost one thousand senior Goldens ranging in age from eight to fourteen years. We have never turned away a Golden because of his or her age. During the program’s first years, certain admission patterns evolved. One of the most troubling involved Senior Goldens. 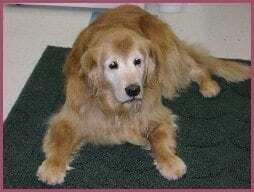 Every fall, for one or two months, a flood of Senior Goldens were turned into Rescue by their owners. These owners declared that now that their children were off to college or out of the house working, they planned to change their own life style and the family Senior Golden was no longer included in their plans. Initially this seasonal event was a shock, but as the years passed we adjusted and planned for this annual phenomenon. The number of Seniors surrendered increased with every passing year so that they now represent 25% or more of our annual admissions. This year there has been a disturbing change in the pattern. The surge of Senior Golden owner turn ins started during the summer of 2002 and never stopped. Many of these sweet “white faces” are arriving in horrible physical condition. Many of the conditions (extreme obesity, matted, covered with hot spots or open sores, urinary infections, etc.) we are seeing reflect long term neglect. Further, the number of older Seniors has increased. In 2002, in addition to the 8 and 9 year olds, we admitted many 10, 11, 12 and 13+ year old Goldens. We hope and pray that this trend does not continue, but fear it will and we must plan for the worst case scenario. We now consider this to be both an immediate and a long term issue. The cruel emotional and physical situations that these very vulnerable Senior Goldens face has touched us deeply and called us to action. 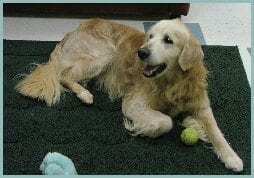 The marked increase in admissions of older Senior Goldens has refocused us on their short term and long term needs. To help meet these needs, this Spring we will be remodeling the old kennel to give it a more home like atmosphere. The separate renovated area will be called The Senior Center at Riverview. The amenities will facilitate expanded individual care plans for the Senior Goldens who use the Center as a temporary, and in the case of hospice situations, even a permanent home. This Center, unlike the regular kennel, will not be just a temporary short term stopping off place on a Rescue Golden’s journey towards a prompt adoption, but instead will offer a specialized area for those Senior Goldens who may be with us for a prolonged time. The increased admissions of much older Senior Goldens with multiple health problems make it possible that, despite the fact that appropriate adoption placement is still the primary goal for each Rescue Golden, realistically some may spend their final days at Riverview. The Senior Center at Riverview is being established to maximize the quality of life for these special Senior Goldens. All these amenities will be provided to Senior Goldens who stay with YGRR — whether for a short stay, long stay or permanently. Here’s an example of one Golden girl who would benefit. Stacey is representative of Goldens who will benefit from improved amenities of the Senior Center. She has been with YGRR for six months. Eleven year old Stacey was surrendered to YGRR because her owner could not afford treatment for a diabetic dog. Stacey had been adopted from the neighbors when she was four years old. Stacey was diabetic upon admission to YGRR. With a special diet prepared by our kennel staff, weight loss and exercise, her condition is under control without requiring any insulin. Stacey is a very sweet and mellow girl with a medium energy level. She is a completely trustworthy housedog and can be left alone for about six hours. She is very good with cats but she won’t “share” her toys with other dogs. Stacey loves children and she lived with young ones in her previous home — in fact, she would frequently visit the schoolyard! Stacey’s new owner would need to continue with her raw meat diet and supplement regimen to keep her insulin free. Her owner will also need to continue with a weight loss program and walking to keep her weight down. The second part of the expanded comprehensive approach to this population’s needs involves adoption. The goal for each Rescue Golden, despite his/her age, is adoption — their own special, loving, forever home. Because of the recent significant increase in the admission of older Senior Goldens, some with special medical needs, we realized that some type of adoption support program would be necessary to assist these older Seniors find appropriate homes. In response to this need, YGRR has established a program called YGRR/CARE (Comprehensive Assistance for Rescue Elders) to help approved applicants adopt and take these older Seniors into their homes and hearts. The YGRR/CARE Program offers comprehensive assistance to families or individuals adopting a Rescue Golden 10 Years or older at the time of adoption. 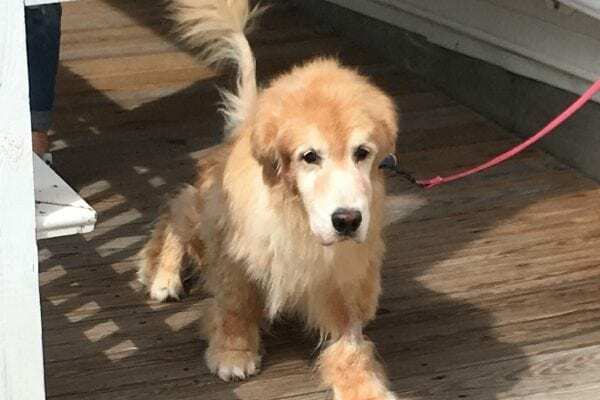 During the Rescue Golden’s lifetime, YGRR will pay for diagnostic testing and approved extraordinary medical care for adopted Seniors who are 10 or older at the time of adoption and are enrolled in the YGRR/CARE Program. Prior approval is required for YGRR to accept financial responsibility for any medical care. This prior approval is given by YGRR’s Executive Director. If there is any question regarding the treatment program being requested, the Rescue Golden’s owner and veterinarian will discuss the situation with YGRR’s Executive Director. Together, they will decide what is the best plan of action for the individual dog. YGRR will make the final decision regarding the funding of medical treatments after a diagnosis is made. Diagnostic work ups such as, but not restricted to, X-rays, biopsies, blood tests will be funded. The medical care will have to be given in a YGRR approved facility to be paid for by YGRR. Billing will have to be submitted directly to YGRR. YGRR will not pay for yearly physicals, stool checks, annual blood work or immunizations, immunization titers, annual heartworm test or heartworm preventative for dogs in this program. The adopter is responsible for this basic care. YGRR will not pay for food unless it is a special prescription diet ordered for a specific medical condition. All these conditions will be outlined in detail in a supplementary adoption contract between YGRR and the adopter. Misty has been at YGRR for six months. Ten year old Misty was surrendered to us because her owner had a partial hip replacement which made it difficult to take care of Misty. Indeed, her owner almost fell over Misty once — a very dangerous situation for both the dog and her person. Misty also had a number of hot spots, abscesses and burst sebaceous cysts. All have now completely healed. She had a severe urinary tract infection which has resolved. She is on a hypoallergenic diet and supplements to avoid skin infections. Misty’s only continuing serious problems are chronic ear infections. She will need to be maintained on special antibiotics and daily ear cleaning. Because of her age, an adopter may choose to enroll Misty in the YGRR/CARE program. In her situation the antibiotics are very specialized for a specific long term problem. If she is enrolled in the YGRR/CARE program when adopted, the medication will be provided to her adopter by YGRR. Misty is a well behaved girl with a medium energy level. She is completely trustworthy in the house. Misty loves cats and she gets along with other dogs. Although she never lived with children, she spent a lot of time in their company and likes them. Misty’s a typical Golden who wants to be petted by everyone she meets and who loves to ride in the car and swim. Due to her diminished hearing resulting from chronic ear infections, she should not be off leash in an open area since she cannot hear her name called. YGRR has also established a special outreach to senior people to encourage them to adopt older Senior Rescue Goldens. This is a part of the YGRR/CARE Program which offers additional support services to people over the age of 70 who adopt Rescue Goldens 10 and older. This is called the Senior to Senior Project. Recognizing that, with some assistance, these older approved adopters can provide wonderful homes for our older Senior Goldens motivated us to develop this Senior to Senior Project. Senior people (70 and older) and their adopted Senior Golden (10 years and older) enrolled in the YGRR/CARE Program receive all the benefits described above. In addition, they are offered financial, social and physical support services. Many older people live on a fixed income and some no longer drive. These issues might make them hesitant to assume the responsibilities associated with adopting a Senior Golden. This project is designed to help these people adopt and properly care for older Senior Goldens in their homes. Monthly (or more often if necessary) phone contact by a designated YGRR staff member with the adopter to assess current needs, provide supportive counseling and put a plan in place to meet any needs noted. YGRR volunteers will provide transportation, at no cost, to and from the veterinarian and for grooming visits as necessary. YGRR will provide short term boarding, at no cost, at Riverview in the event of a family emergency. In the event that the adopter can no longer provide care for the Senior Golden, YGRR would, of course, accept the Golden back into the Senior Center at Riverview and provide it with life long care. The YGRR management has developed the CARE program in order to continue to provide the best care for Rescue Seniors. The feedback about this innovative effort from YGRR members and friends has been very positive. Many have asked, “How Can I Help? I’d like to do something for these old Golden guys or gals.” There are two principal ways in which YGRR members and friends can help this program succeed. YGRR has established a wish list of items to outfit and furnish the Senior Center. To give us maximum flexibility in obtaining the most suitable articles and increase our “purchasing power,” YGRR requests that donors send donations to be used for the purchases — rather than purchasing and donating the individual items. Donors may make unrestricted gifts for the Senior Center or may designate specific items. 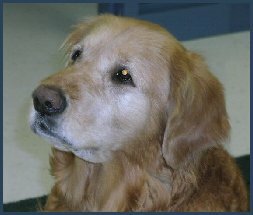 In 1996 a special fund to provide financing for the care of senior Goldens was established. Each year since, donations to the Look Beyond Time Fund have grown. Your donations have made it possible for us to continue to admit seniors without hesitation and have also told us that you, our members and friends, want us to continue to help this most vulnerable population of Goldens. The programs outlined above will be reliant on continued donations to our The Look Beyond Time Fund. Individuals who wish to support veterinary care and boarding for the seniors are encouraged to donate to the Look Beyond Time Fund. Donations to the Look Beyond Time Fund helps YGRR take care of senior Goldens like Morgan. Twelve year old Morgan was surrendered to YGRR at the age of twelve because his owners divorced. Upon admission to YGRR, Morgan was overweight, arthritic, had ear infections and eleven large masses. One large mass was a grade 2 mast cell tumor. Chest and abdominal x-rays and bloodwork were normal. The tumor was excised with wide margins. Morgan has lost 10 lbs and with a nutritional joint support supplement, he has become much more mobile. This low key guy with a great disposition has already been adopted by two of YGRR’s most loyal senior adopters, Suzanne and Scott B. YGRR was able to provide him with all the care that he needed because of donations to the Look Beyond Time Fund. And, thanks to great people like Suzanne and Scott, he is already enjoying life in his new home. Although YGRR provides the very best care and most comfortable surroundings for all Rescue Goldens, the goal will always be to find each one a permanent home. If you can open your home and heart to a senior you will find, as others have, that their quiet composure and gentle sweetness more than make up for the shorter time they will spend with you. Twelve year old Corey was surrendered to YGRR because his owners divorced. He had lived with them since being found as a stray seven years earlier. Corey has been with YGRR for almost three months. Upon admission, he had a urinary tract infection, conjunctivitis, was thin, had five large masses and a history of seizures. The infection has been cleared up, all masses removed and biopsied, and his eyes are now fine. With no clear pattern of seizures, Corey has not been placed on antiseizure medications. He was found to be severely hypothyroid which can induce or aggravate epilepsy. Until a clear pattern of seizures is seen, it is recommended that Corey’s condition be monitored but not medicated. Despite the stress of surgery and moving into the kennel, he has been seizure free. We are hopeful that any seizures will be mild and infrequent and that he will not require medication. Corey is a very friendly, sweet, blonde boy with a medium energy level. Although he spent a lot of time chained outdoors with a dog house, he is a trustworthy house dog. Corey loves cats (he even let them eat from his bowl) and other dogs! He lived with five children ranging in age from age 3 to 12. He adores people and riding in the car — and would love to come home with you! The development of the YGRR/CARE Program and creation of the Senior Center at Riverview by YGRR in response to new identified needs presented by the Rescue Goldens we serve illustrates the sensitivity and commitment to the needs of the Rescue Goldens shown by both the staff and the Board. Susan and I are very proud to be a part of this management/care team which truly puts the needs of each and every Rescue Golden above all else. We are also very thankful for the support and encouragement of YGRR’s “Golden Family” that allows us the freedom and the ability to develop systems that provide the care that is necessary to make each Rescue Golden’s life better. Thank you. Results of these tests detect liver and kidney disease and other conditions which are not uncommon in older dogs. The diseases and conditions can progress and become very serious, even life threatening, with few symptoms exhibited until toward the end of the disease when unfortunately few treatments are still effective. These tests can give the veterinarian information that will allow the dog to be treated quickly and appropriately. That is why we have it done for all the Senior Goldens. If caught early many of these conditions respond well to very basic treatments and the dog have a good quality and quantity of life. If these conditions progress until symptoms are obvious, the prognosis is much more grim even with vigorous interventions. These tests also show if the dog has anemia which can be caused by a multitude of conditions, some treatable and some not and tells the veterinarian the status of the red and white blood cells and platelets which can give him important information about the dog’s blood building, clotting and infection fighting abilities. This information can help to rule in and out some malignancies and helps to lead to further more specific testing when necessary. Recently we have added an admission chest and abdominal X-ray to the Seniors’ protocol. This is done to give the veterinarian more information about each older dog’s condition. Even without any symptoms, the dog could have serious medical issues with heart or lung problems and tumors. It is a proactive step, helping to diagnose and, if appropriate, institute more specific testing and treatments for dogs that do show positive findings on the X-rays. These admission X-rays also help to determine what further tests such as Ultrasounds and CT scans might be needed to properly diagnosis and treat the Senior Goldens. They also act as base line tests that can be referred back to for comparison if the individual Golden develops problems in these areas later on. This Admission Senior Golden Protocol can be applied to any Golden no matter what its age if the Veterinarian feels it would be helpful for that dog, but it is given routinely to all Senior Goldens admitted to YGRR.